Hiding behind the honeycomb grille are extra radiators to enhance cooling, while the look of the full-width front spoiler is said to be derived from motorsport. You can have the spoiler’s blade in the same color as the rest of the car or you can ask Audi to paint it in glossy black or aluminum. At the back, the fixed wing has gained new side winglets making the TT RS appear more masculine, and there’s a discreet strip extending from one taillight to the other. All TT RS models come as standard with LED headlights, but you can pay more and opt for matrix LED headlights and OLED taillights. Buyers get to pick from eight colors, including the Kyalami green shade exclusively offered on the TT RS. It joins the Pulse Orange and Turbo Blue colors new to the TT RS, and there are matte aluminum and glossy black visual packages to spice things up furthermore. 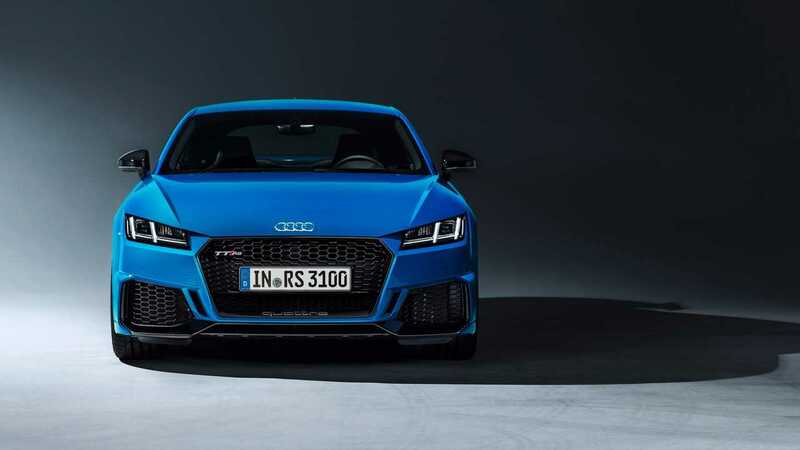 At the heart of the TT RS Coupe and Roadster continues to be the turbocharged five-cylinder gasoline engine pushing out a healthy 400 horsepower and 354 pound-feet (480 Newton-meters) of torque. The International Engine of the Year for the ninth time in a row, the 2.5 TFSI enables the coupe to hit 62 mph (100 kph) in 3.7 seconds en route to an electronically governed 155 mph (250 kph) or an optional 174 mph (280 kph). The Audi Sport muscle is channeled to the Quattro all-wheel-drive system through a seven-speed S tronic transmission sending all that power to the 19- or 20-inch wheels. The alloys are paired with black eight-piston Brembo brake calipers as standard, but you can have them in red – Brembo carbon-ceramic brakes are also available, although they'll likely carry a hearty premium. At an additional cost, Audi will be more than happy to throw in the RS sport suspension with adaptive dampers to improve handling. Audi will begin to take orders in Europe tomorrow, February 7. At home in Germany, the TT RS Coupe is going to set you back €67,700, with the Roadster kicking off at €70,500.